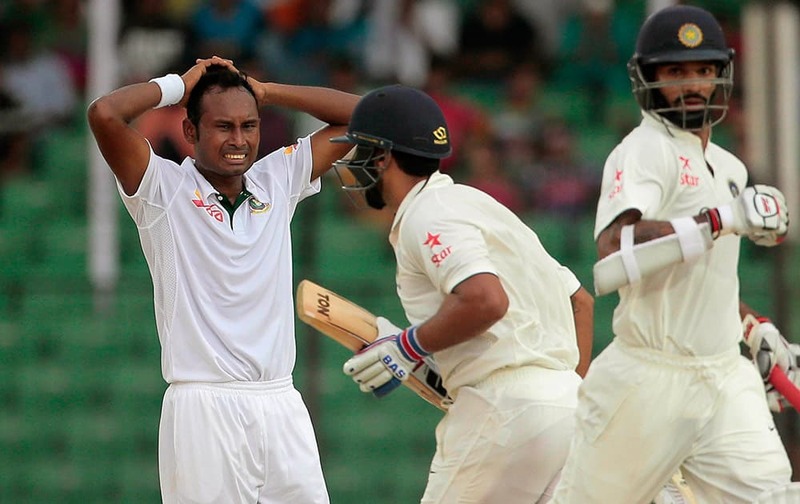 Bangladesh’s Litton Das plays a shot on the last day of their test cricket match against India in Fatullah, Bangladesh. 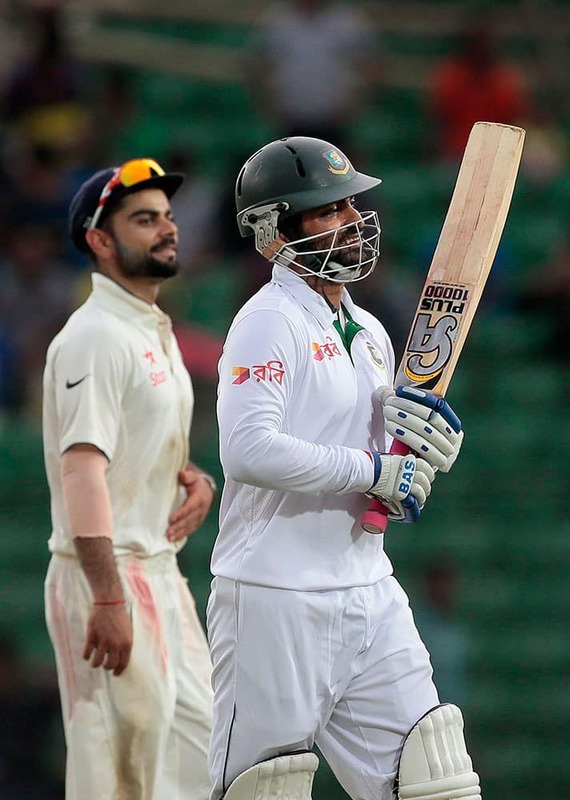 India’s captain Virat Kohli, left, and Bangladesh’s Tamim Iqbal walk back to the pavilion at the end of their cricket test match in Fatullah, Bangladesh. 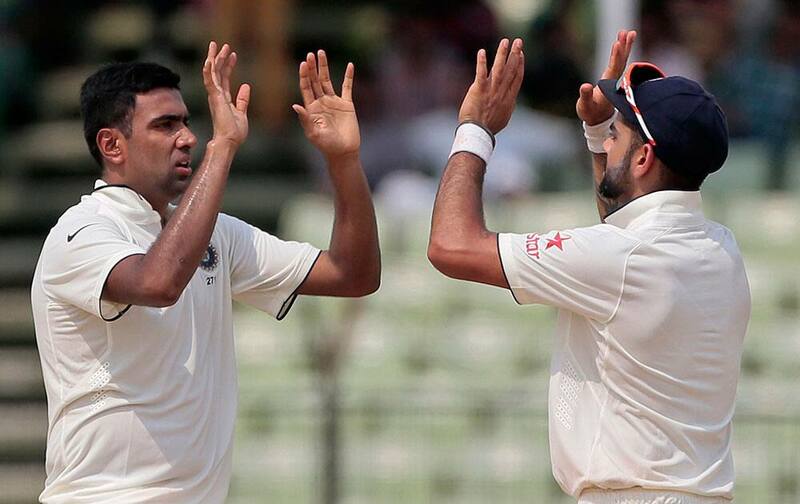 India’s Ravichandran Ashwin, left, celebrates with captain Virat Kohli after the dismissal of Bangladesh’s Shuvagata Hom on the last day of the test cricket match between them in Fatullah, Bangladesh. 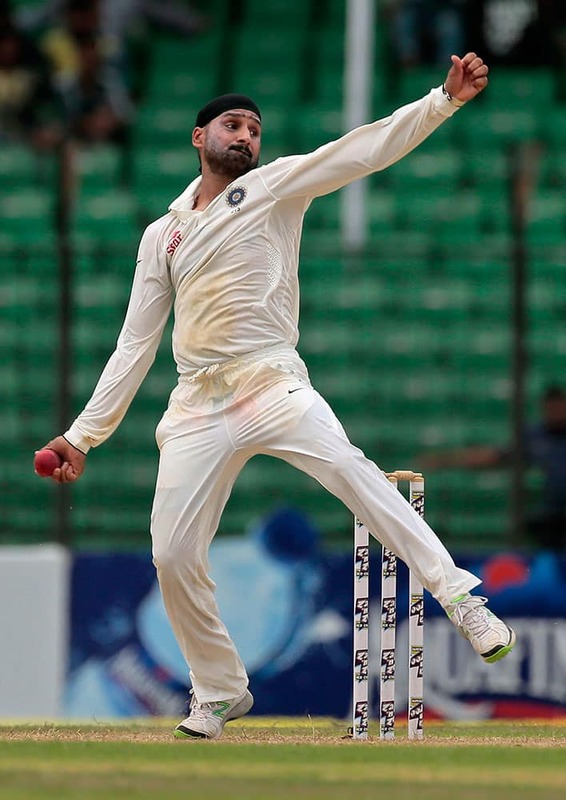 India’s Harbhajan Singh bowls on the last day of their test cricket match against Bangladesh in Fatullah. 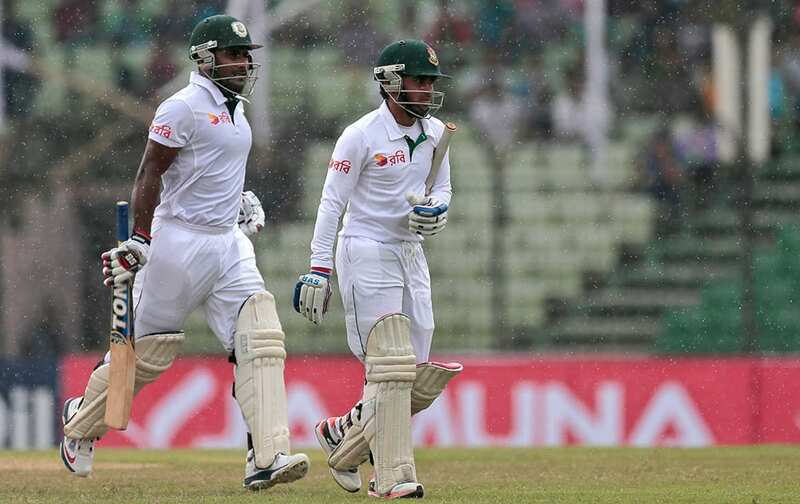 Bangladesh’s Mominul Haque, right, and Imrul Kayes walk back to the pavilion as rain interrupts play during the fourth day of their test cricket match against India in Fatullah, Bangladesh. 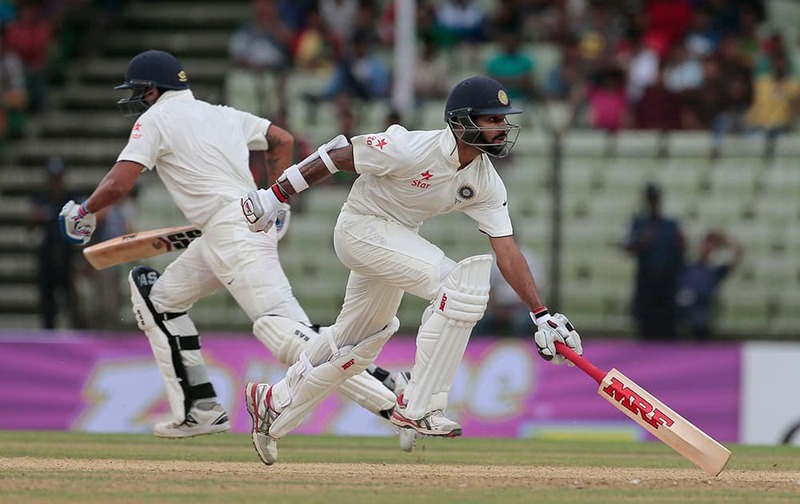 Bangladesh’s Mominul Haque, right, plays a shot, as India's Ajinkya Rahane drives to catch the ball during the fourth day of their test cricket match against India in Fatullah, Bangladesh. 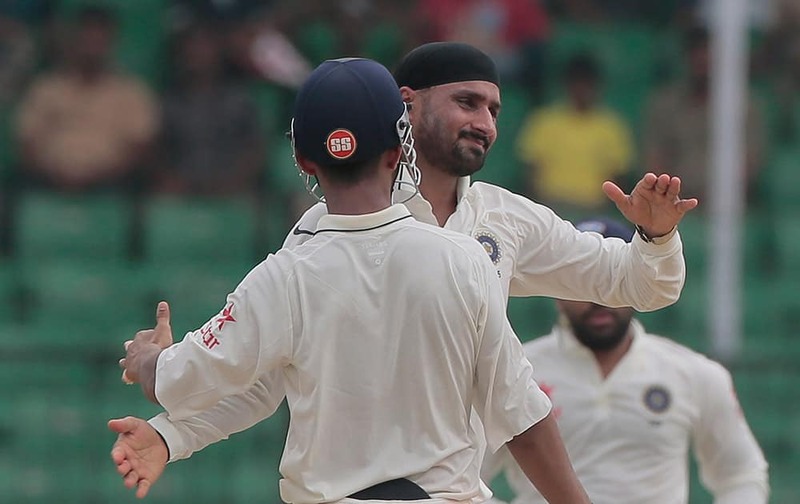 Harbhajan Singh, face to the camera, celebrates with his teammates after the dismissal of Bangladesh’s Mominul Haque during the fourth day of their test cricket match in Fatullah, Bangladesh. 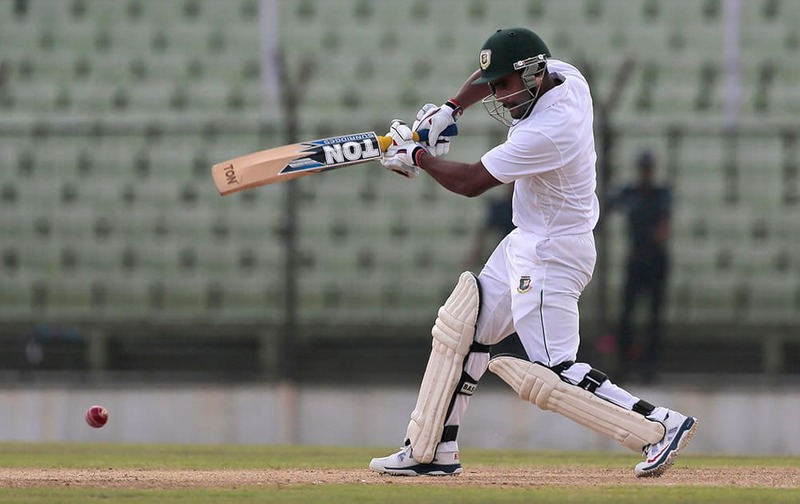 Bangladesh’s Imrul Kayes plays a shot during the fourth day of their test cricket match against India in Fatullah, Bangladesh. 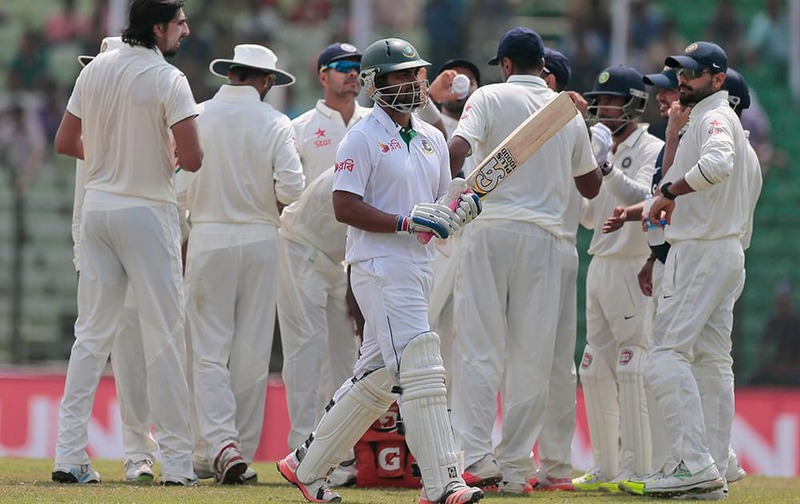 Bangladesh’s Tamim Iqbal, center, walks back to the pavilion after his dismissal by India’s Ravichandran Ashwin during the fourth day of their test cricket match in Fatullah, Bangladesh. 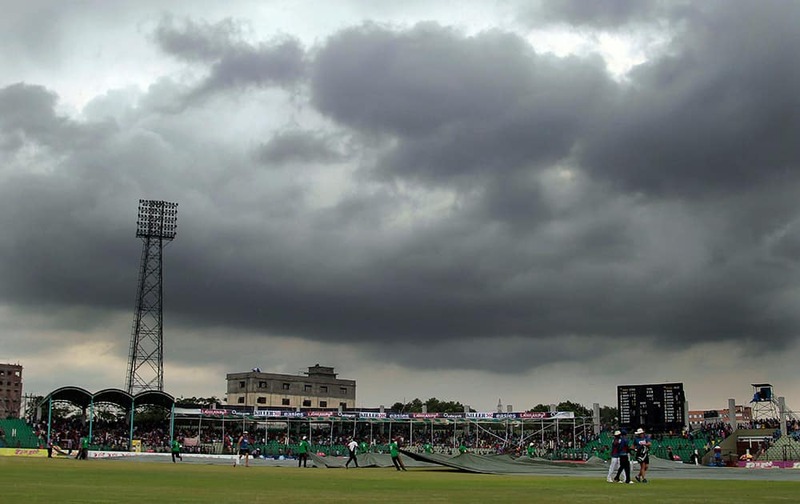 Bangladesh’s ground staff pull covers on the field due to rain during the third day of their test cricket match between Bangladesh and India in Fatullah, Bangladesh. 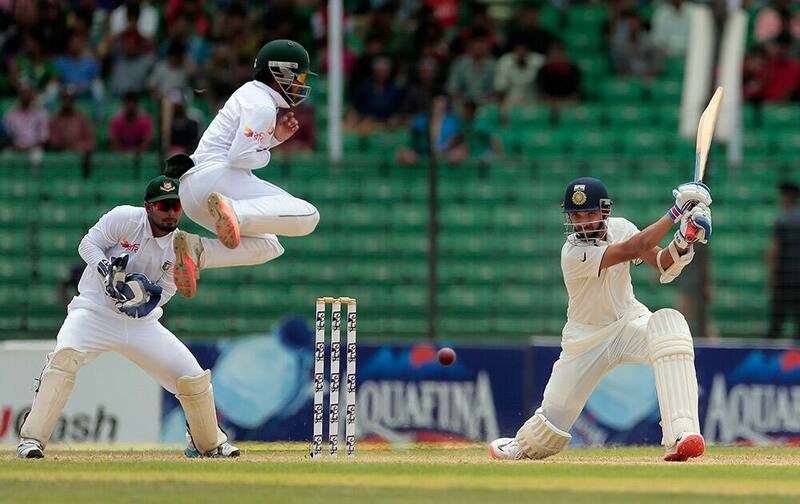 Ajinkya Rahane plays a shot as Bangladesh's Mominul Haque jumps during the third day test cricket match against Bangladesh in Fatullah, Bangladesh. 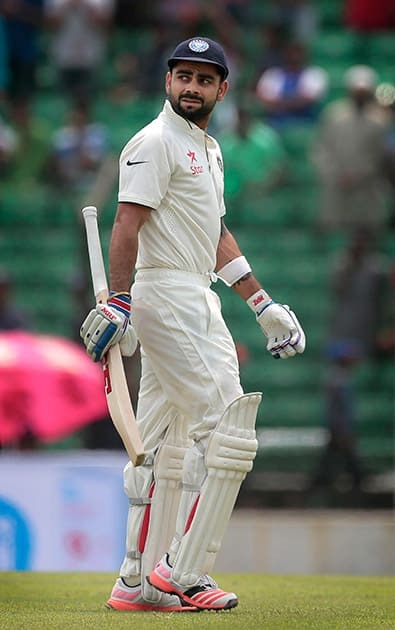 Virat Kohli walks back to the pavilion after his dismissal by Bangladesh’s Jubair Hossain during the third day test cricket match in Fatullah, Bangladesh. 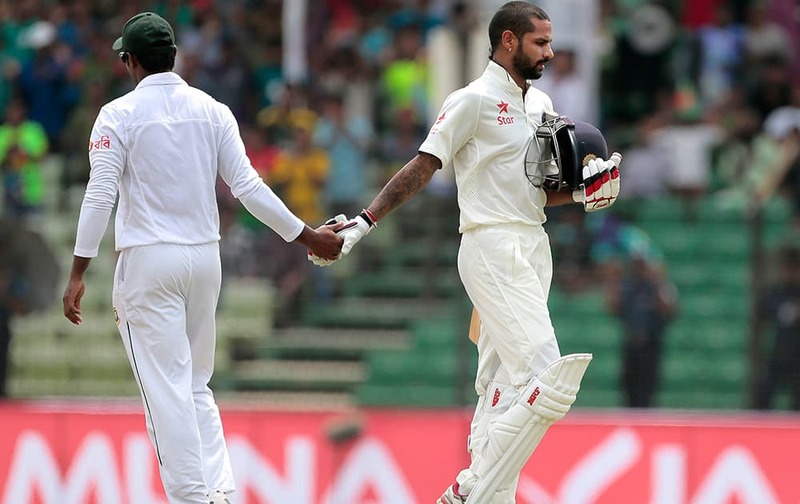 Shikhar Dhawan shakes hand with a Bangladeshi player as he leaves after getting out during the third day cricket match in Fatullah, Bangladesh. 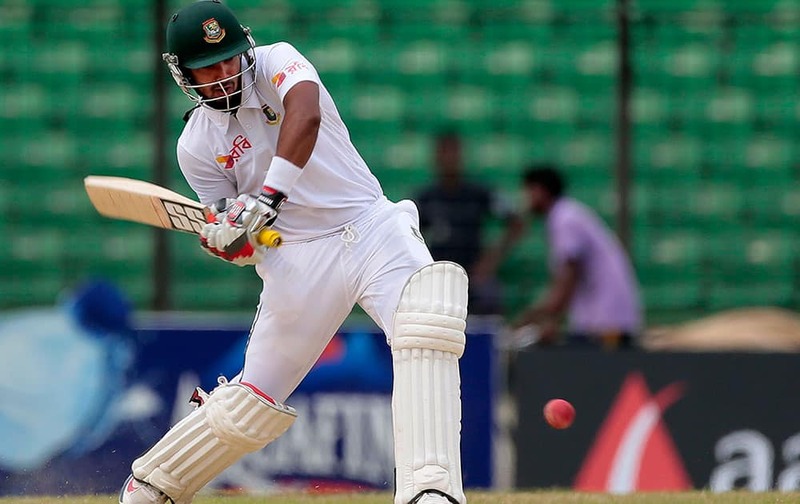 Shikhar Dhawan, plays a shot as Bangladesh’s wicketkeeper Litton Das, center, and Shakib Al Hasan watch during the first day of their test cricket match against Bangladesh in Fatullah, Bangladesh. 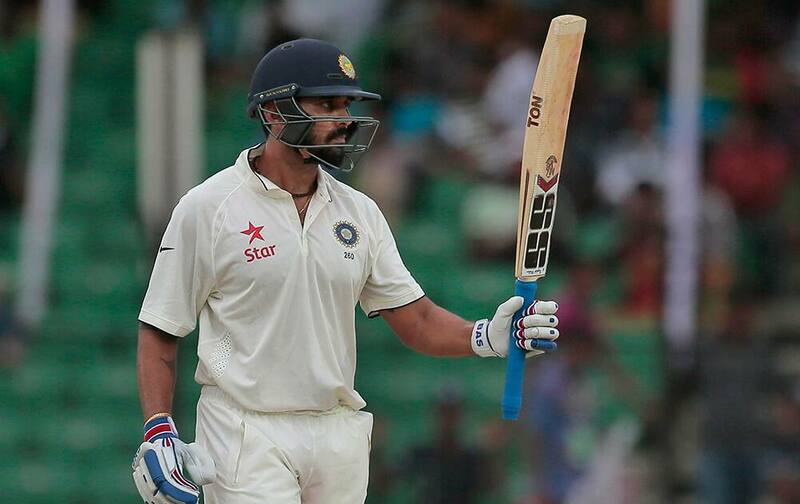 Murali Vijay acknowledges the crowd after scoring fifty runs during the first day of their test cricket match against Bangladesh in Fatullah, Bangladesh. 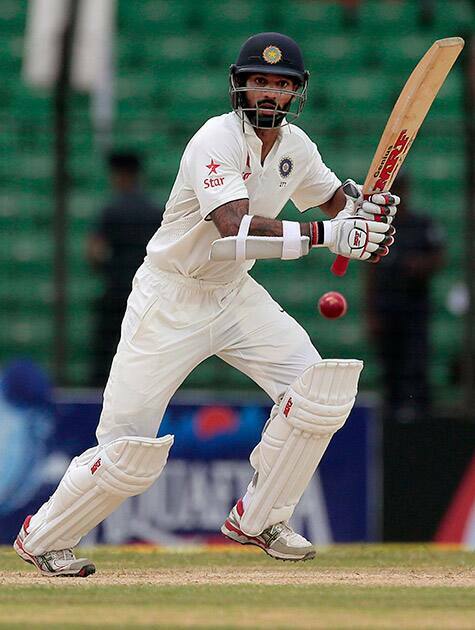 Shikhar Dhawan, plays a shot during the first day of their test cricket match against Bangladesh in Fatullah, Bangladesh. 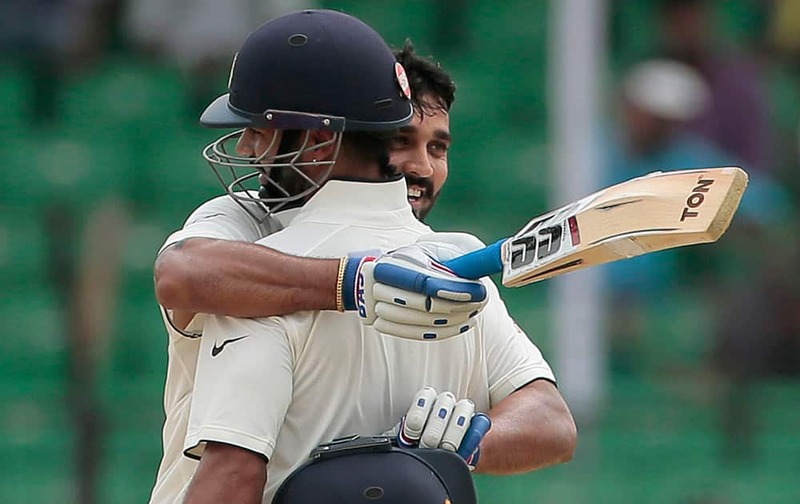 Shikhar Dhawan, celebrates with his teammate Murali Vijay after scoring hundred runs during the first day of their test cricket match against Bangladesh in Fatullah, Bangladesh. 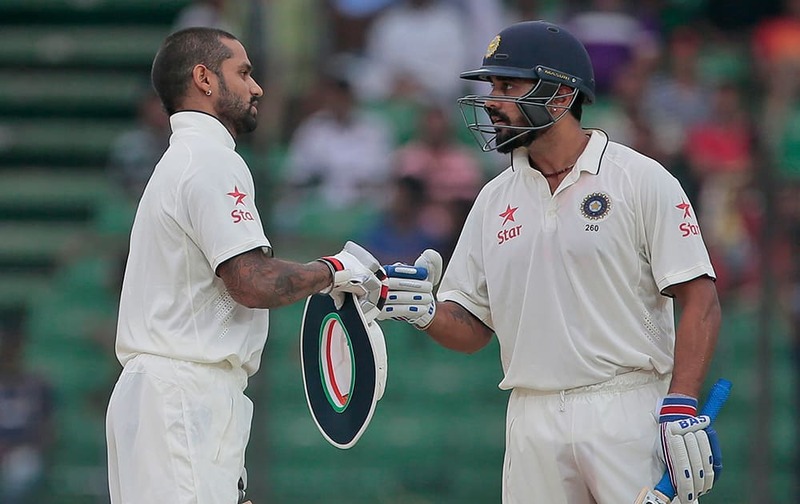 Murali Vijay and Shikhar Dhawan run between wickets during the first day of their test cricket match against Bangladesh in Fatullah, Bangladesh. 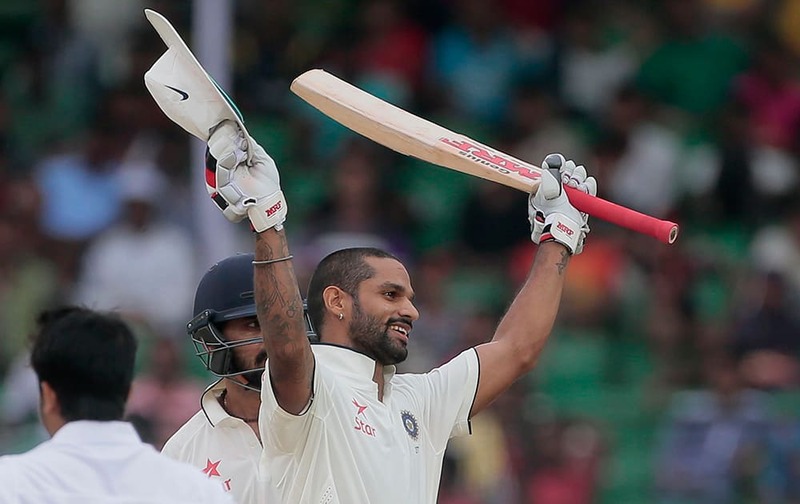 Shikhar Dhawan, acknowledges the crowd after scoring a hundred runs during the first day of their test cricket match against Bangladesh in Fatullah, Bangladesh. 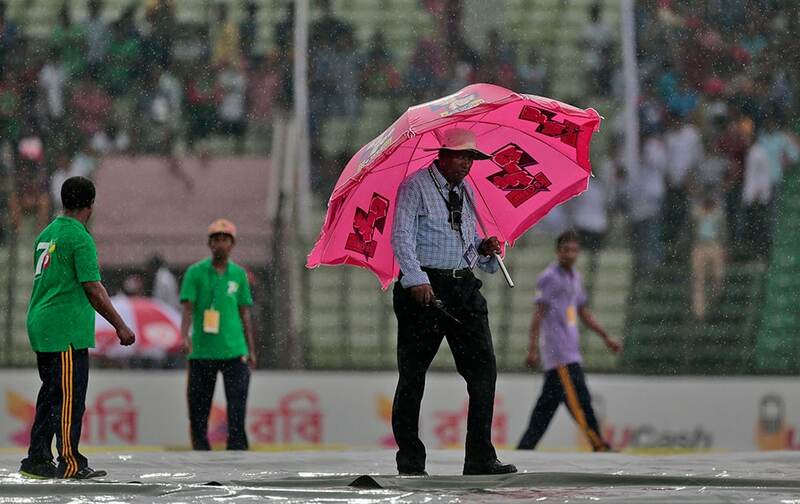 Curator of the cricket field walks with an umbrella over ground covers as it rains during the first day of the test cricket match between Bangladesh and India in Fatullah, Bangladesh. 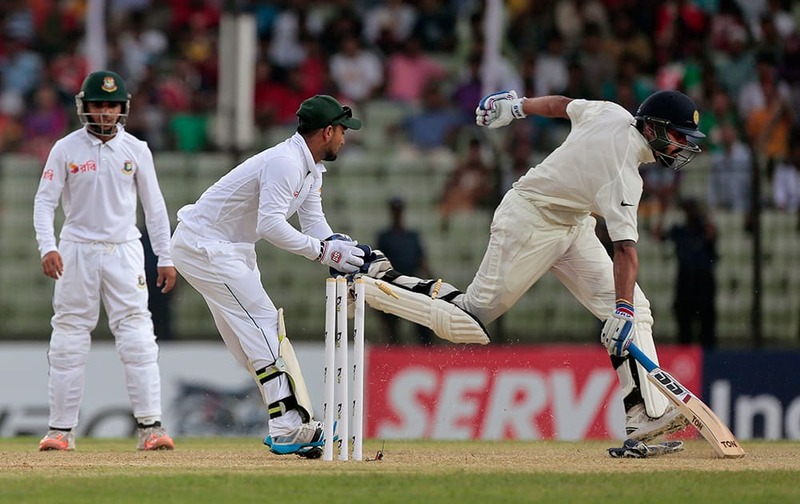 Murali Vijay, makes his ground as Bangladesh’s wicketkeeper Litton Das, center, attempts to run him out during the test cricket match between them in Fatullah, Bangladesh. 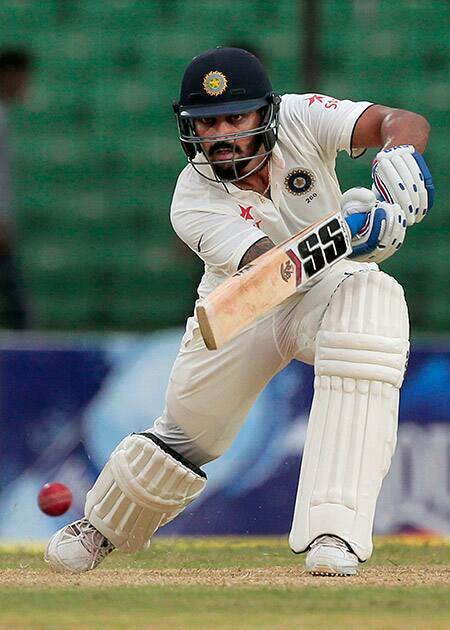 Murali Vijay plays a shot during the first day of their test cricket match against Bangladesh in Fatullah, Bangladesh. 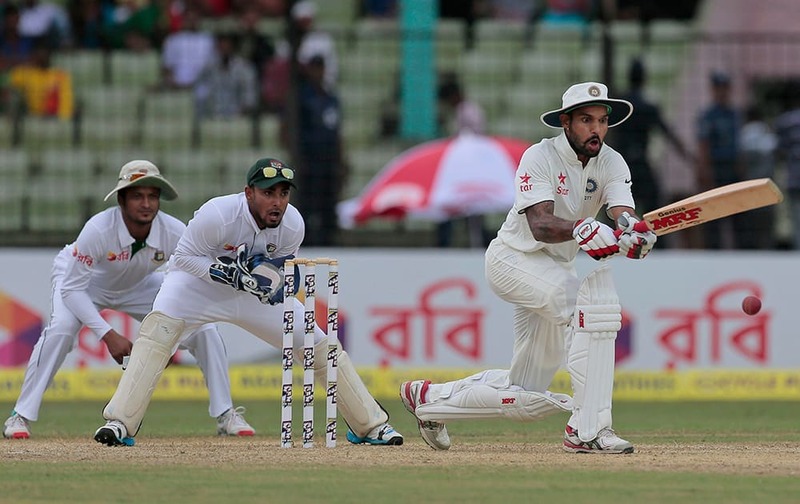 Bangladesh’s Mohammad Shahid, left, reacts as India’s Murali Vijay, center, and Shikhar Dhawan run between wickets during the test cricket match between them in Fatullah, Bangladesh. 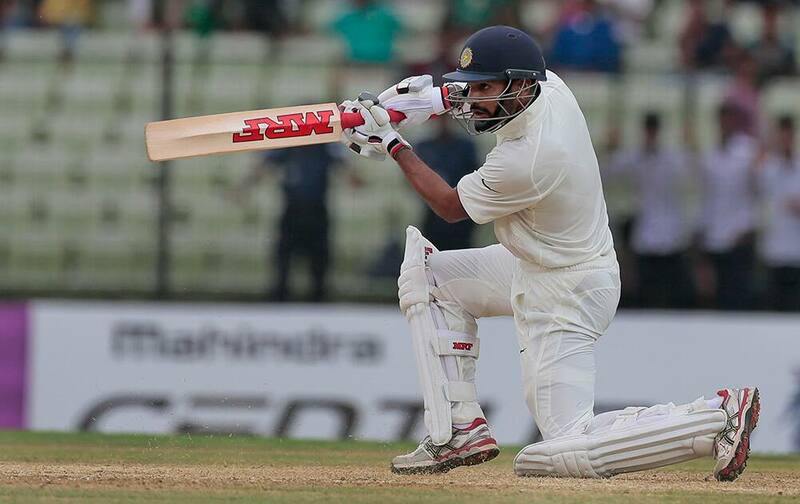 Shikhar Dhawan plays a shot during the first day of their test cricket match against Bangladesh in Fatullah, Bangladesh. 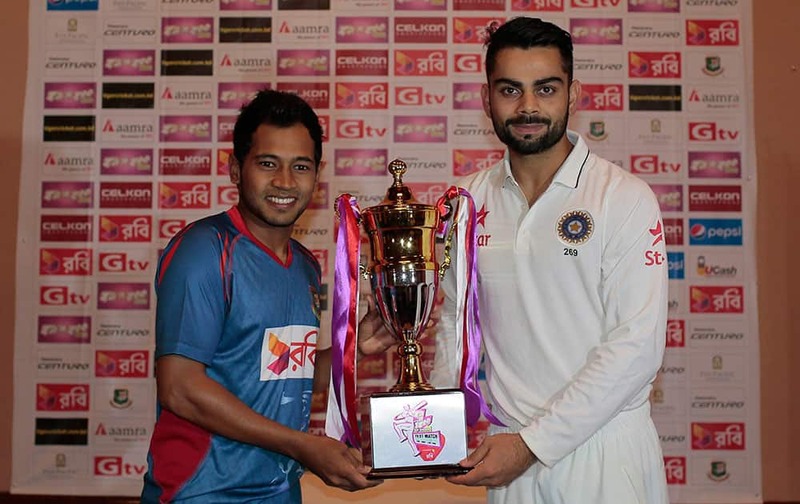 INDIA’S TEST MATCH CAPTAIN VIRAT KOHLI, RIGHT, AND BANGLADESH’S TEST MATCH CAPTAIN MUSHFIQUR RAHIM POSE WITH THE TROPHY ON THE EVE OF THE ONLY TEST MATCH OF THEIR SERIES IN DHAKA, BANGLADESH. 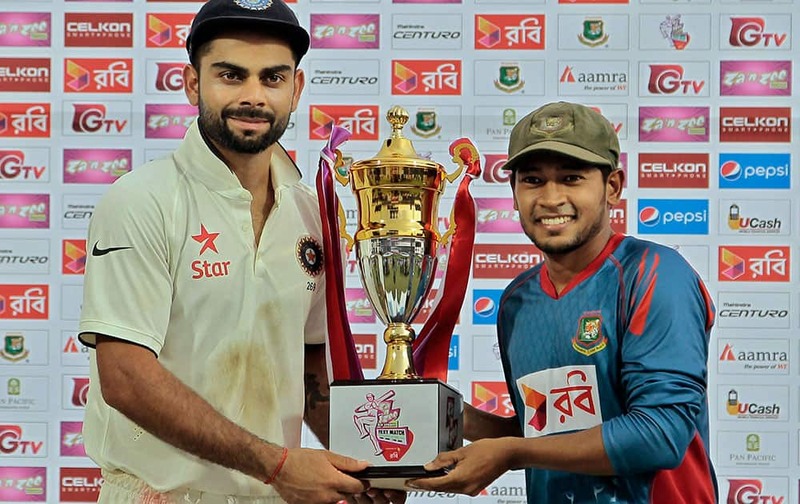 Virat Kohli holds a soccer ball during a practice session ahead of their test cricket match against Bangladesh in Dhaka, Bangladesh. 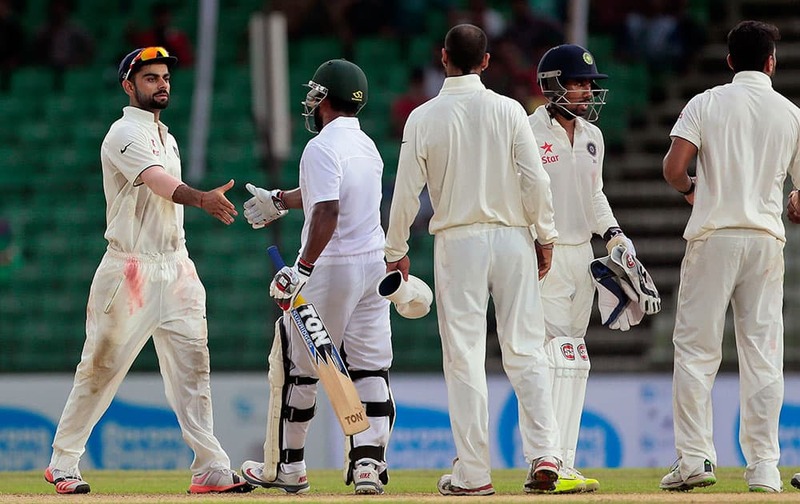 Indian players, Varun Aaron, Shikhar Dhawan, Bhuvneshwar Kumar and Ajinkya Rahane stretch during a practice session ahead of their test cricket match against Bangladesh in Dhaka, Bangladesh. 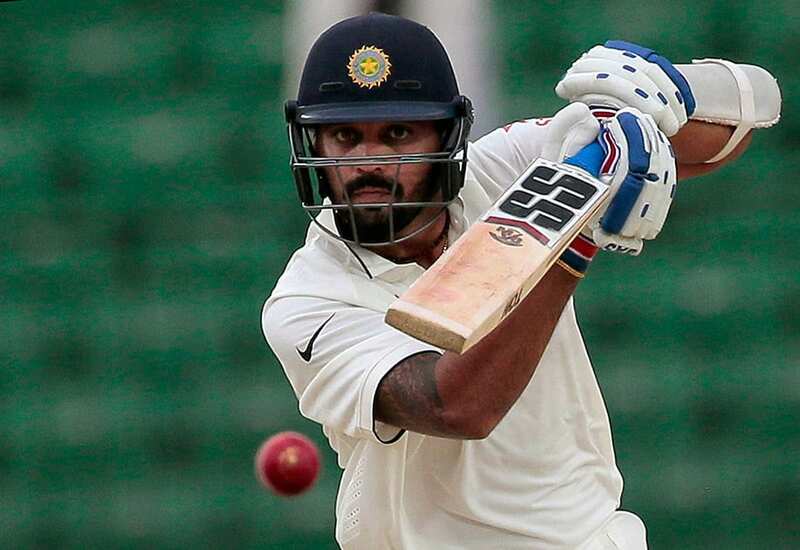 Shikhar Dhawan stretches during a practice session ahead of their test cricket match against Bangladesh in Dhaka, Bangladesh. Virat Kohli plays with a soccer ball during a practice session ahead of their test cricket match against Bangladesh in Dhaka, Bangladesh. Ishant Sharma stretches during a practice session ahead of their test cricket match against Bangladesh in Dhaka, Bangladesh. Ajinkya Rahane prepares to take a catch during a practice session ahead of their test cricket match against Bangladesh in Dhaka, Bangladesh.